WASHINGTON, D.C. -- The ideological profile of the ideal Republican presidential candidate looks much the same now as it did before the 2008 election. Six in 10 Republicans nationwide, including independents who lean toward the GOP, want the party to nominate a conservative to represent it in 2016. About one in three want a moderate candidate, while support for a liberal is in the single digits. These findings, from a Dec. 2-6 Gallup poll, are similar to the results from a December 2007 poll. The current party nomination contest is arguably different from the one that produced 2008 nominee Sen. John McCain. 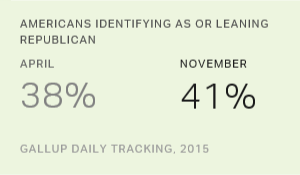 Yet the percentage of Republicans who prefer a conservative candidate is not. As the 2016 primary contests draw nearer, several of the more than dozen Republican presidential candidates continue to jockey for the unofficial status of being the race's "true conservative." The party's front-runner, real estate mogul Donald Trump, has bucked the trend. Several of his views are not ideologically pure, but his positions on immigration -- the marquee issue of his campaign -- are arguably to the right of every other candidate in the race, and may explain his relatively strong appeal to very conservative Republicans. Meanwhile, Democrats' desire for a "liberal" or "very liberal" candidate has grown, from 30% in 2007 to 36% now. However, the largest share of Democrats and Democratic leaners -- 40% -- still mostly prefer a moderate candidate. This desire has shrunk somewhat from 48% in 2007. Because of these shifts, Democrats are now about as likely to say they prefer a liberal nominee (36%) as a moderate nominee (40%), while in 2007, they had a clearer preference for a moderate (48%) than for a liberal (30%). A sizable minority of Democrats, 21%, say they would like to see the party nominate a candidate who is "conservative" or "very conservative," similar to the 19% who said the same eight years ago. The increased desire for a liberal candidate is consistent with the increase in liberal views among Democrats and Democratic-leaning independents on social and economic issues. Democratic hopeful Sen. Bernie Sanders, who identifies as a socialist, may be the main beneficiary of those trends. He has positioned himself as the liberal alternative to Democratic front-runner Hillary Clinton. Gallup research has shown that Sanders does better on a relative basis among Democratic liberals than among Democratic moderates or conservatives. While the preference for a liberal candidate has enjoyed some momentum among Democrats, six in 10 Democratic identifiers still want a moderate or conservative candidate, which could help Clinton in the primaries if she can straddle the line between those political viewpoints. The past eight years have arguably been a transformative era in U.S. politics. There have been waves of Democratic and Republican takeovers of Congress, a federal government shutdown over serious differences about governing, and the sprouts of ideological movements in the forms of the tea party and Occupy Wall Street. Despite all of this, the desire among Republicans and GOP-leaning independents for a conservative candidate has not waned in the party's time out of the White House. However, a sizable one in three Republicans and GOP-leaning independents would prefer a moderate. Though Democrats remain most interested in a moderate candidate, their openness to a liberal one has grown. Results for this Gallup poll are based on telephone interviews conducted Dec. 2-6, 2015, on the Gallup U.S. Daily survey, with a random sample of 824 adults, aged 18 and older, living in all 50 U.S. states and the District of Columbia. For results based on the total sample of 366 Republicans and independents who lean to the Republican Party, the margin of sampling error is ±7 percentage points at the 95% confidence level. For results based on the total sample of 363 Democrats and independents who lean to the Democratic Party, the margin of sampling error is ±7 percentage points at the 95% confidence level. All reported margins of sampling error include computed design effects for weighting. Donald Trump ties with Hillary Clinton as the best-known presidential candidate among national adults, but Ben Carson has gained the most in terms of name recognition since July. Americans' party preferences have been closely divided between Republicans and Democrats since August, about the time of the first Republican presidential debates. Prior to that, Democrats had an edge. A special analysis of the images of Republican presidential candidates highlights each candidate's relative strengths and weaknesses among Republicans and Republican-leaning independents. Hillary Clinton continues to see her favorable rating fall, despite once being broadly popular a few years ago. She has lost support among all three political identifications, especially GOP-supporters and independents.